From the tiny Korg D8 that we reviewed, I moved on to the substantially large Fostex DMT-8VL, another great eight-track recorder, which was available with either a 2.55 GB hard drive (60 minutes worth of eight-track recording) or without an internal hard drive. 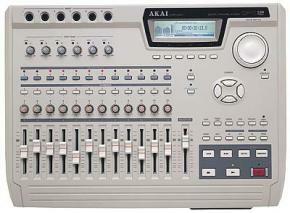 Again, SCSI, S/P DIF and RCA analog outs are standard, while the mixer has a more expansive eight analog inputs (the first two with low/mid/high impedance switches), MIDI In and Out, two aux sends, two stereo aux returns, stereo monitor outs and separate recorder ins and outs bypassing the mixer. The most immediately distinctive feature of the Fostex is that the mixer has a separate monitor section, meaning that you can simultaneously set up two different mixes of a song—very handy, for example, if you don’t want to hear that synth track in the headphones when you’re tracking the vocal but do want it in the mix when you play back your take. 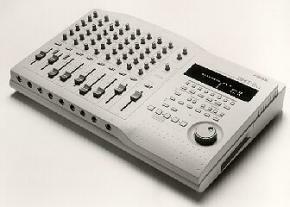 As with an analog ministudio, you select a mixer channel’s function by flipping a switch, which makes recording a breeze—just plug into any input, select the track you want to record to, turn up the fader level on your channel, and (the only slight quirk) don’t forget to set the monitor level on the track you’re recording to. You can assign an input channel to any track, and each channel on the mixer has high and low EQ knobs. Unlike the Korg D8, however, the Fostex does not have built-in effects, so you’ll have to use the aux sends to patch in some outboard gear. 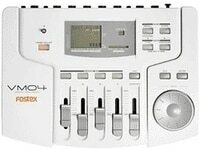 Most recording, overdubbing, editing and mixing tasks are a piece of cake on the Fostex. The DMT-8VL gets a nod over the Korg D8 in the editing stage for two main reasons. Firstly, the clipboard system on the DMT-8VL allows you to listen to the audio you’ve cut or copied before you paste it back into the track, so you can make sure you’ve edited it correctly. Secondly, the Fostex jog wheel (which, among other things, simulates the function of scrubbing a reel of tape back and fourth to find the exact beginning or end of a song or section) feels more comfortable and seems more precise than Korg’s D8, though working any such mechanism well takes practice. The DMT-8VL also has a cool Mix Bounce function, which lets you bounce and entire stereo mix to tracks 7 and 8 without erasing what was previously on those two tracks. In other respects, the Fostex DMT-8VL and Korg D8 match up well feature wise. The Fostex comes out ahead on usability, and its colorful LED display screen is much easier to deal with. The Korg D8, on the other hand, is smaller and has the advantage of built-in effects. Gear-Vault Classifieds is an eBay alternative. Come sell your used guitars and amps with us, for free! My custion is ¿Can you record 8 tracks simultaneously with the fostex dmt 8 vl? I dont see it clear.